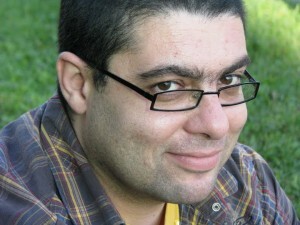 Majdi Bou-Matar is the Artistic Director and founder of MT Space as well as the Artistic Director of the IMPACT, an international biennial theatre festival, hosted by the MT Space. An active member of the arts community in Waterloo Region, Bou-Matar has also directed several productions in Beirut and been an active participant in several theatre, television, and film projects in the Middle East and Tunisia. In Beirut, Majdi’s directing portfolio includes: Nijinsky: the Hour of his Wedding to the Lord (1997); Miss Julie (1999); Something Like Macbeth (2000). In Canada, he has directed for The MT Space: Three-Legged Horse (04-05), Seasons of Immigration (2006), Yes or NO! (2007), Exit Strategy (2008), and The Last 15 Seconds (2009). What do you look for in a script? I am personally attracted to the physical, the inter-cultural and the inter-disciplinary. How much the script allows for new and challenging presentations of the body and its politics? What frictions and negotiations does the script present between different cultures? And how much does the script challenge the conventional deadly forms of theater that are usually imprisoned in categories and within the solid walls around performance disciplines? From a practical standpoint – is there an ideal number of characters or script length? Particularly in my work at The MT Space, I prefer casts between 3 and 8 performers and shows that are between 50 and 90 minutes in length. This is related to the particular aesthetics of the work we do in terms of its simplicity and minimalist qualities. Does script formatting matter or can it get in the way? I don’t think there is a rule or prescribed format for any work of theatre. Plays breath, grow and evolve in the space of creation, in the body of the performer and with the audience attending the show. How do you feel about detailed stage directions? In my work stage directions are useless. I believe in recreating any piece of theatre in an immediate way directly related to the time, place and people of creation. This might sound radical, but I don’t usually read the script as I am directing it, I rely only on witnessing it through the bodies and voices of my performers as they play in the workshop space. What turns you off a script? It would be too long of a list to mention here! Does the topic matter as much as the delivery? Or are there topics so important any discussion is worthy of staging? What matters to me most is the relationship between the performer and the story. What does the performer have to say about the play/ character/or script. It is in this in-between space of negotiation and witnessing that theatre prevails. In that sense delivery might take the front row, but both the topic and delivery are important depending on the relationship that exists between them. What bad habits from television / movie scripts does a playwright need to break? Write for the wide shot rather than the close-up. Write what the camera can not see. While the camera can capture life very accurately and imaginatively, it cannot capture the theatricality of life. The theatricality of life only exists through the medium of theatre. While playwrights can benefit a lot from the motion picture as a form, they need to understand theatre as a totally different form where the moment can never be repeated (as in film); on the contrary the moment lives and dies constantly within the moment itself. Therefore, playwrights should not write plays that could be repeated and re-produced. They should write plays that can be born, breath, grow, change and die endless times. What is the most important play of the past 100 years and why? I don’t know what the ‘most important’ play is in the past 100 years. Important to whom, I wonder, and by what standards? Theatre history, the canon and the published plays of the last 100 years have mostly been written, evaluated and categorized by Western male academics, and are not by any way inclusive of all the important theatre achievements of the century. To my personal taste and experience Harold Pinter has been one of the most exciting playwrights (to read) of the 20th century. Fadhel Jaibi (Tunisia) is the most skilled theatre creator I have ever encountered and Pina Bausch – in my opinion – is the most influential figure in the 20th Century theatre/dance. Fill in the blank. I wish people would stop telling playwrights to _________________? …write plays, but instead to createtheatre. If you could give emerging playwrights three pieces of advice, what would they be? Work in the studio with the actors because theatre is created in the body and space, not in the mind and on paper. Simplify and write fewer words because the magic of theatre is in what is not said. Let the few words you write be rhythmic and poetic like a song.